ALEXANDRIA, Va. (CNS) — It took years, but Arturo and Maria Perez and their children now receive Communion at Sunday Mass as a family. For some time, the couple didn’t participate in the sacraments because their marriage was not valid in the eyes of the church although they had long been civilly married. That changed this summer when the Perezes were married at their parish, Good Shepherd Church, along with 20 other couples in “la gran boda,” or “the big wedding” — a convalidation ceremony June 24. 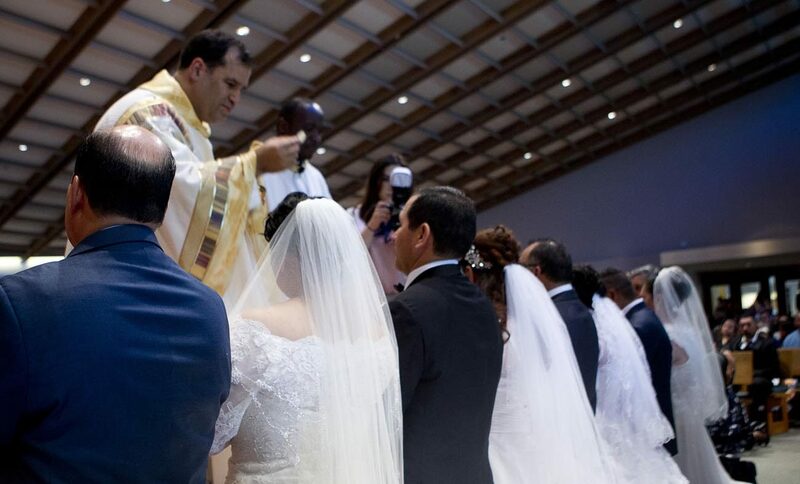 The ceremony takes place when couples who have been civilly married “want to make their wedding proper with the church or get a blessing,” said Father Ramon Baez, one of two parochial vicars at the parish who performed the ceremony. Maria Perez described the ceremony as a blessing for her family. She said her daughter Catherine had been asking her why she didn’t receive the Eucharist at Mass. “She was asking me all these questions and that’s when I said I need to do something about it,” Maria Perez said. The wedding ceremony was particularly emotional for her because she had not received the Eucharist for more than 12 years. Good Shepherd’s first convalidation ceremony occurred in 2002 and continued every two years until 2016. The event was such a success that the parish decided to have another this year. Leah Tenorio, parish director of Hispanic ministry, has noticed that convalidation is helpful for couples and their children in building their faith. The ceremony is important to the couples who want their marriage to be valid in the church. “For the first time, they will receive the sacrament of matrimony and also holy Communion, which is a great joy for them,” Father Baez said. Preparing for convalidation takes more than six months. The couples fill out a questionnaire called FOCCUS, or Facilitating Open Couple Communication, Understanding and Study, and the responses are discussed with the priest or deacon. This conversation is designed to ensure that the couple is well prepared for the sacrament of marriage and that the decision to validate their marriage was freely made, Father Baez said. “In other words, the individual has no serious emotional, or psychological impediments. Nor is the person being forced to marry against their will,” he explained. Couples also are required to provide a series of documents, including a marriage license and attend a weekend retreat on the sacrament of matrimony. Father Baez said the retreat focuses on communication, compatibility and marriage preparation. The Perezes attended the retreat with 20 other couples, where they participated in discussions and reaffirmed their commitment to marriage. After the retreat, the couples gathered in front of the church’s congregation to proclaim their faith and the intention to validate their marriage. A few weeks later, the couples found themselves making their vows in front of family and friends. Each couple had padrinos, or godparents, at the wedding. For the Perezes, Ricardo Campos and Micaela Perez, Arturo’s sister, traveled from Mexico the day before the ceremony. Maria Perez thinks that guidance from the couple is beneficial because they have been married for more than 20 years. “For me, it’s like oh my God, I look up to them,” she said. The ceremony also is important to the godparents who can share insights into the importance of building a strong marriage and witnessing their love before God and the parish community. During the ceremony, an oversized rosary was placed over the heads of the couples. The tradition of “el lazo,” or “the loop,” is popular among Mexican and Hispanic communities. Micaela Perez sees the rosary as a bond between the two people getting married.